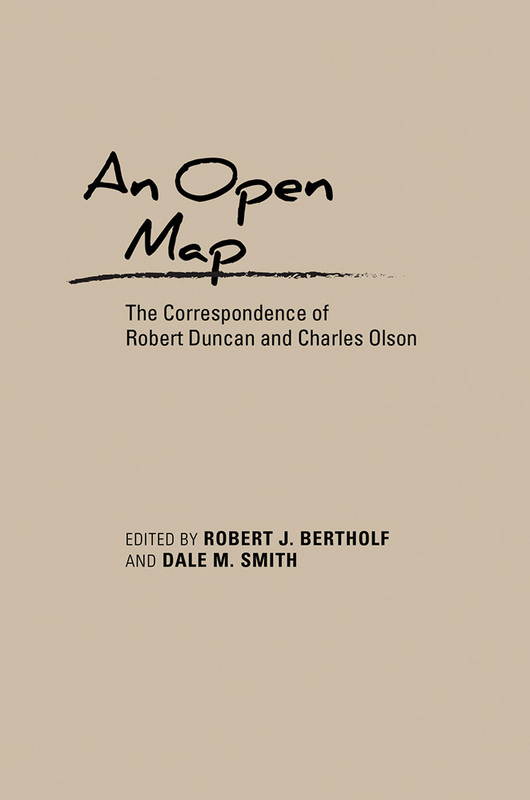 The correspondence of Robert Duncan and Charles Olson is one of the foundational literary exchanges of twentieth-century American poetry. The 130 letters collected in this volume begin in 1947 just after the two poets first meet in Berkeley, California, and continue to Olson’s death in January 1970. Both men initiated a novel stance toward poetry, and they matched each other with huge accomplishments, an enquiring, declarative intelligence, wide-ranging interests in history and occult literature, and the urgent demand to be a poet. More than a literary correspondence, An Open Map gives insight into an essential period of poetic advancement in cultural history. Robert J. Bertholf (1940–2016) served as the curator of the Poetry Collection at the University of Buffalo for twenty-five years. He is the author and editor of numerous books, including several about Robert Duncan and his work. Dale M. Smith is an associate professor in Ryerson University’s Department of English. He is the author of Poets Beyond the Barricade: Rhetoric, Citizenship, and Dissent after 1960 and Slow Poetry in America.